"I love this chair, it's been great for me. I don't really have to give a lot of thought to what it can do or where it can go. I just go." Click here to read Bryan's full profile. "We were always experiencing issues with the chair Torrance had before the Q6 Edge. The Edge is more reliable and much easier to use." Click here to read Torrance's full profile. "The Q6 Edge gives me the independence I need and allows me to live the life I want. I don't like being fussed over, so being able to catch public transportation like everyone else is a huge factor in my life." Click here to read Jordan's full profile. "This chair allows him to participate with his friends at recess. It gives him support to keep up on the playground." Click here to read Luke's full profile. "The Q6 Edge gives me greater physical reach in the kitchen. I can elevate my seat and easily access areas like the stove or countertops. I can also lift the arms out of the way without having them hit the cabinets. This gives me the freedom I need to gather ingredients and more." Click here to read Chanry's full profile. "I can rely on this chair no matter where I go. It handles different kinds of terrain much better than my previous chair, and it's much sturdier." Click here to read Donna's full profile. "The chair's lift and electronics allow me to interact with my environment more easily. It also makes it easier to get in and out of the car." Click here to read Tim's full profile. "Zeke likes the chair's lift function because it allows him to sit at tables and desks at the right height. I also like the lift because it is easier for me to get him in and out of the chair when necessary." Click here to read Zeke's full profile. "My Q6 Edge looks great, but it's also great for my mobility. No matter where I am, it makes it much easier to get around. It is particularly handy at work, and the chair's recline feature helps relieve the pressure on my back." Click here to read P.J. 's full profile. "With the Q6 Edge, Mikah doesn't miss out on any of the fun of being young. It lets him get out into the world and see what it's all about." Click here to read Mikah's full profile. "The Q6 Edge makes getting around easy so I can focus on the work that I do. Simply put, it lets me live my life on my terms." Click here to read Madonna's full profile. "The Q6 Edge has given me more freedom to hang out with my friends. If they’re riding their bikes, I can easily keep up with them." Click here to read Bryson's full profile. "Morgan loves the speed, the lift, and the recline on his police chair [Q6 Edge]. He's intrigued by everything the chair does." Click here to read Morgan's full profile. "The Q6 Edge is a great chair. It rides smooth and allows me to get places I wouldn't otherwise go. It's basically my feet." Click here to read Jesse's full profile. "Abigail wants to be independent, and the Q6 Edge lets her do that. When her friends play together, she can play too, and when she dances, she can make sounds with her tap shoes on the chair's footrest." Click here to read Abigail's full profile. "I feel like I'm more active now than I ever was. With my Edge, I can socialize more easily and enjoy the outdoors again. It's made the world much more accessible." Click here to read Kiel's full profile. "I get a lot of compliments on my Edge. I like the seat and the way the chair rolls around my apartment so nicely and throughout Miami." Click here to read Stephanie's full profile. "I like my chair because it allows me get around easier. It helps me out a lot. I like the speed of it and I like the way it looks." Click here to read Ondelee's full profile. "I've enjoyed watching Emily go from 'What is this?' with her power chair to seeing her interact with all of the kids. She always wants to be a part of everything. Her drive in life is to be where the action is. And with her Q6 Edge Power Chair, she can be part of the action." Click here to read Emily's full profile. "I'm able to do a whole lot more with my Q6 Edge Power Chair. It's a smooth ride and it holds up very well and I'm not a light guy. 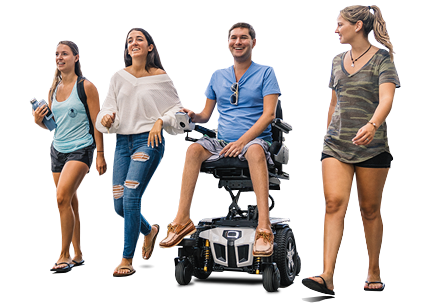 My Q6 Edge has power tilt, a power elevating seat, and power elevating leg rests, so I'm able to do pressure releases when I need to." Click here to read Desmeon's full profile. "I was really stubborn because I thought the wheelchair would inhibit my mobility. I didn't realize how much better my life would be with it." Click here to read Anthony's full profile. "I don't have to stop after school, I can keep going. I use the power tilt and recline to assist with transferring, which gives me more independence." From motorcycles to power chairs, Dwight demands his equipment to perform. Click here to read Dwight's full profile. "I chose the 'Z' because of its high speed motor package. Four miles an hour would not work in New York. I would get run over. The high speed of 8 miles an hour is perfect for getting around the city safely." Click here to read Marc's full profile. "In 10 years, I've used a few different wheelchairs, and my Z is the best by far. I can get anywhere I need around the track, fast, and without worrying about getting stuck. That's important to me." Click here to read Terry's full profile. "We want to maximize her possibilities. That's our goal, and we feel extremely happy and fulfilled with this product." Click here to read Andrea's full profile. "The Q600 makes her feel like she is a little more in control. It gives here more power over her own life." Click here to read Kristen's full profile. "My Q6000z allows me to play hard but then also go out and see things without getting tired." Click here to read Adrian's full profile. "I love this chair, it's easily the most comfortable chair I've ever owned, and the performance is outstanding. My mom says it does better in bad conditions than her car."